Arizona Gov. Jan Brewer signed into law the nation's toughest legislation against illegal immigration Friday, a sweeping measure that supporters said would take handcuffs off police but which President Obama said could violate people's civil rights. The bill, sent to the Republican governor by the GOP-led Legislature, would make it a crime under state law to be in the country illegally. It would also require local police officers to question people about their immigration status if there is reason to suspect they are illegal immigrants. Brewer, who faces a tough election battle and growing anger in the state over illegal immigrants, said the law "protects every Arizona citizen," and said the state must act because the federal government has failed. The bill takes effect 90 days after the current legislative session ends in the next several weeks. Brewer was asked Friday if she could tell whether someone is here illegally, CBS News Correspondent Bill Whitaker reports. "I do not know what an illegal immigrant looks like," said Brewer. "I can tell you that I think that there are people in Arizona that assume they know what an illegal immigrant looks like. I don't know if they know that for a fact or not." In Los Angeles, Cardinal Roger Mahony, head of the country's largest Catholic Archdiocese, called the law "mean-spirited" and compared it to Nazi repression. Still, the law passed with unanimous support from Republican legislators. "Arizona spends $3 billion a year to educate, medicate and incarcerate illegal aliens," the bill's Republican sponsor, state Rep. Russell Pearce of Mesa, said. "Enough is enough." But opponents say it's too much. "The reality of the matter is that certain groups - people who look or sound foreign - are going to be disproportionately targeted by this bill," said the ACLU's Alessandra Soler Meetze. Mr. Obama said in Washington that he's instructed the Justice Department to examine the Arizona bill to see if it's legal, and said the federal government must enact immigration reform at the national level - or leave the door open to "irresponsibility by others." "That includes, for example, the recent efforts in Arizona, which threaten to undermine basic notions of fairness that we cherish as Americans, as well as the trust between police and their communities that is so crucial to keeping us safe," Mr. Obama said. Brewer spoke about the national attention the bill attracted after she signed it into law. "We must acknowledge the truth: people across America are watching Arizona," Brewer said. "Some of those people from outside our state are waiting to see us fail … We cannot give them that chance. We must use this new tool wisely. We must react calmly." Homeland Security Secretary Janet Napolitano, who was Arizona's governor before joining the Obama administration, issued a statement criticizing the bill after Brewer signed it into law. "The Arizona immigration law will likely hinder federal law enforcement from carrying out its priorities of detaining and removing dangerous criminal aliens," Napolitano said in the statement. "With the strong support of state and local law enforcement, I vetoed several similar pieces of legislation as governor of Arizona because they would have diverted critical law enforcement resources from the most serious threats to public safety and undermined the vital trust between local jurisdictions and the communities they serve." Napolitano echoed Mr. Obama's earlier comments that immigration reform should be done at the federal level. "This issue cannot be solved by a patchwork of inconsistent state laws," Napolitano said. Brewer was under intense pressure from anti-illegal immigration groups and lawmakers in her own party to sign the bill. With hundreds of people surrounding the state Capitol, protesting that the bill would lead to civil rights abuses, Brewer said she wouldn't tolerate racial profiling. She said critics were "overreacting." Demonstrators have been camped outside the Capitol since the measure passed out of the Legislature on Monday. Their numbers have grown steadily throughout the week, with buses bringing protesters from as far away as Los Angeles. About a dozen supporters of the measure also gathered. U.S. Rep. Raul Grijalva, a Democrat who opposes the measure, said he would close his Arizona offices at noon Friday after his staff in Yuma and Tucson were flooded with calls this week, some from people threatening violent acts and shouting racial slurs. Pearce said Mr. Obama and other critics of the bill were "against law enforcement, our citizens and the rule of law." Other provisions of the bill allow lawsuits against government agencies that hinder enforcement of immigration laws, and make it illegal to hire illegal immigrants for day labor or knowingly transport them. 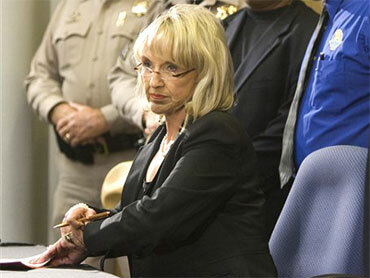 Brewer heard from opponents to the bill Thursday night, CBS News Affiliate KPHO-TV in Phoenix reports. "Governor, we ask, no, we respectfully demand, that you veto Senate Bill 1070," said Erica Gonzalez-Melendez, a chairwoman of the Board for Chicanos Por La Causa, a powerful Latino community organization. Capitol police estimated 1,200 students and activists demonstrated at the Arizona State Capitol Thursday in protest of the bill, Senate Bill 1070. Supporters of the bill also were also at the capitol Thursday. Many argued the governor can't afford not to sign the immigration bill. "The federal government has let this build. The state is in shambles. (We have) ID theft, rapes, murders and it's coming from over the border. It's time we seal it and it's time we clean house," said a supporter who would not identify herself. Mayra Morales, one of the organizers, said she asked the governor to veto the bill because this issue is very personal for her. "I don't want to be racially profiled. Our families will live in fear. Our community will live in fear," said Morales. Arizona Lawmakers Send Immigration Bill to Gov.